Friuli Homeland (LA PATRIE DAL FRIÛL) history, in a nutshell, has been kindly provided to me by Mr. Robert Pontisso through Mr. Erik V. McCrea's website: “In 1077 the Holy Roman Emperor granted temporal rights to the Patriarch of Aquileia (the chief bishop in the area). In other words, in addition to being a spiritual leader, the Patriarch became the prince of his own territory. Thus the Patrie dal Friûl became in effect an independent state. This lasted until 1420 (I believe), when the Patrie was conquered by the Venetians. To this day April 3rd is celebrated (by some, anyway) as the anniversary of the date in 1077 when Friuli was granted independence.” La Patrie dal Friûl is also the name of their main monthly magazine, and its masthead even uses that auspicious date in its chronology: the March 2004 issue says “926 years”, while the April issue says “927 years”. 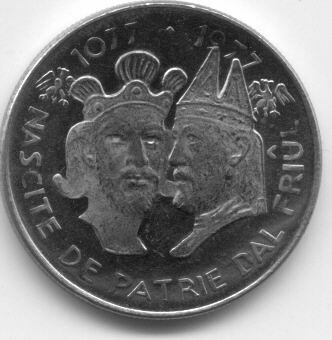 The obverse legend states: UN MODON PAROMP E O'TORNARIN A PLOMP and the reverse legend states: NASCITE DE PATRIE DAL FRIUL on both coins shown above. 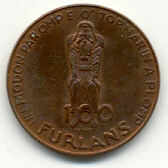 The 100 Furlans piece, dated 1977 is reported by Mr. Pontisso as “The coin was struck to commemorate the 1976 earthquake that killed about a thousand people in Friuli.” The inscription, “One brick each and we'll get ourselves back up” (more literally, “One brick per man and we'll be plumb again”), was meant to encourage a spirit of rebuilding and communal solidarity in the face of disaster. He initially assumed, and plausibly so, that its denomination “was meant to symbolize the work of 100 Friulians” in the reconstruction effort. The obverse shows what's presumably a Longobard or Lombard man (Friuli in general, and the town of Cividale del Friuli in particular, were important centers of Lombard culture). On the reverse is an 11th-century bishop's chair from Cividale. Another source of information has been Mr. Walter Giuliani. He states that the leader of the Friuli separatist party was a friend of the Manager and “the boss-engraving” (Mr. Guerrino Mattia Monassi) of the Italian State Mint (Istituto Poligrafico e Zecca Dello Stato), and he asked the Mint to issue these coins “to keep money for earthquake victims”. The coins, and some currency as well, were used for a short while; one Furlan was equal in value to one Lira. He reports that there are two additional coins in this series. 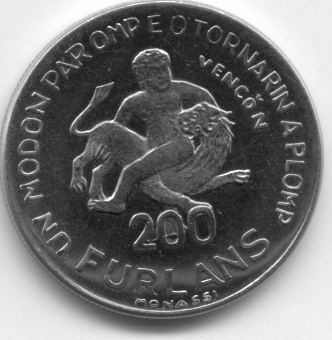 One is a 1977 200 Furlans (with the exact same inscriptions as the previous example): the word “Vençon”, accompanied by the depiction of a man wrestling a beast, also appears on its obverse; this is the name of a site that was particularly hard-hit by the earthquake, so perhaps the image may be the town's symbol. The reverse presumably depicts Emperor Henry IV and Patriarch Sigeardo of Aquileia, the former having granted the latter sovereignty over Friuli in 1077. The engraver of this piece as well as the 100 Furlans, was Mr. Monassi. The final coin is a 1983 1,000 Furlans. 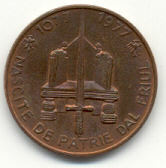 The text on the obverse reads “To remember the 1000 years of Udine”. In the center are some buildings, landmarks of Udine. As the dates on the reverse suggest, 1983 was the 1000th anniversary of the first known mention of this city, capital of Friuli (this earliest reference is from a document in which the Emperor grants Udine's castle to the Patriarch). The images on this side are of “Oton II” (Emperor Otto II) and “Rodoalt” (Patriarch Rodoaldus of Aquileia). These 3 coins were “made by teachers of the museum of the medal” in Buja (native land — a villa in Friuli — of many master medalists). This museum also has a “school for medals,” and they do work for the abovementioned Mint.